Today we are making the BEST Instant Pot Creamy Tomato Soup! This is the tomato soup that everyone loves and requests, especially as the weather gets cooler. This is NOT that can of tomato soup you may have opened when you were a kid – but the kids will like it. Creamy, full of flavor and easy enough to make on a busy weeknight. This is an awesome Instant Pot recipe to try for pressure cooking newbies too! You don’t have an Instant Pot? What? Now is a great time to make the investment. I made this creamy tomato soup in my 6 qt Instant Pot. I actually have 2 of them because I often find I want to make a main and a side dish in them for the same meal! 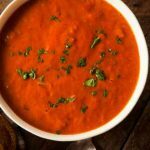 This quick and easy Instant Pot creamy tomato soup pairs beautifully with a grilled cheese sandwich or try it with some homemade rolls or old fashioned drop biscuits. You can’t really go wrong here! Why Make Your Own Soup? 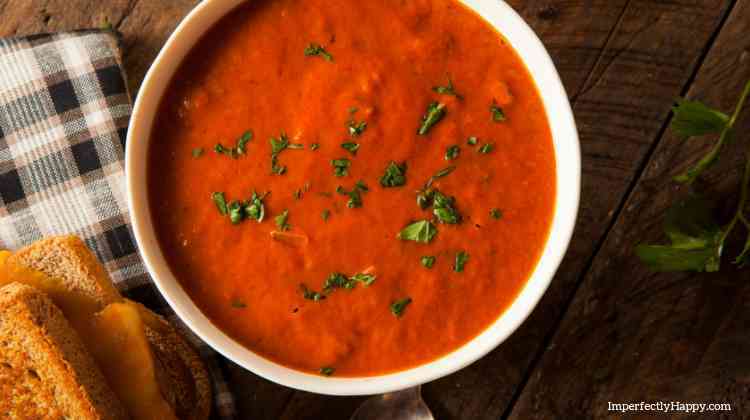 Making your own Instant Pot Creamy Tomato Soup ensures that you get the best ingredients possible – no funky additives. If you look at the label of a standard canned soup in the store it is loaded with sodium and fillers; not to mention the flavor is sub-par in my opinion. I hope this easy Instant Pot recipe shows you how easy homemade soups can be! This recipe is also completely gluten free and can be prepared for vegetarians by swapping the chicken broth for vegetable broth. You can keep the ingredients pretty standard or using Fire Roasted Tomatoes for more flavor. Out of basil? 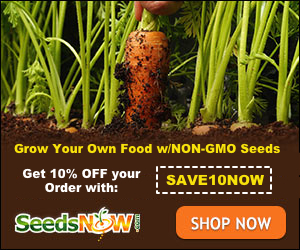 Use oregano or an Italian spice blend mix – this recipe is very forgiving. You really won’t spend much more time in the kitchen either – the Instant Pot is going to do most of the work for you, no watching or stirring a stock pot with this recipe. Homemade Instant Pot Creamy Tomato Soup with less than 10 minutes cook time? Yes, please! You’ll need an Immersion Blender or a high powered blender like a Vitamix to get a smooth and creamy consistency with this soup. Put your Instant Pot on sauté, add the avocado oil and diced onions and cook until onions have turned translucent, then turn the Instant Pot off. To the Instant Pot add you diced tomatoes, crushed tomatoes, tomato paste, minced garlic, chicken broth and seasonings. Give everything a quick stir to fully combine. Put Instant Pot lid on and set the valve to sealed. Cook on manual high pressure for 8 minutes. Once cooking is complete do a quick release. Using an immersion blender or Vitamix, blend until the soup mixture is smooth or to your preferred consistency. Now add in your heavy cream and blend to fully incorporate it. Top with some shredded cheese to really knock it out of the park! Need MORE Soup Recipes? Check out these family favorites!